April 14th, 2018. Distributors are reporting the official English release date for the first Extra Booster of the Standard format, V-EB01: The Destructive Roar, will be August 3rd, 2018. Moreover, the set's prerelease "Sneak Peek" event will be held from July 27th to 29th. The accompanying prerelase kit sent out to shops will include two rubber playmats, 39 booster packs for use at the event, and 9 promotional cards to be distributed to participating cardfighters. Each case of 24 booster boxes of the set will include reprints of the Premium/G format strides Overwhelm, Dirty Picaro, and Gluttony Dogma, which will not be usable in Standard format. Furthermore, each booster box will include one of three randomly-inserted illustrated Gift Markers, one for Protect, one for Accel, and one for Force. 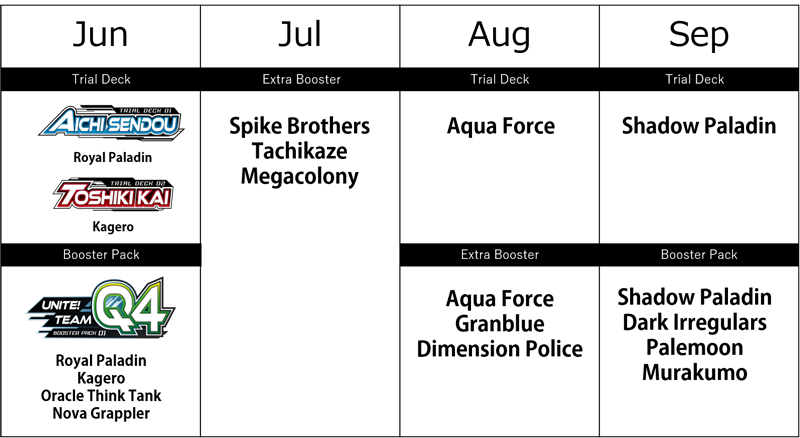 The manufacturer's recommended retail price for individual booster boxes is $71.88, almost $40 above what Japanese players pay for their own boxes at the current exchange rates. 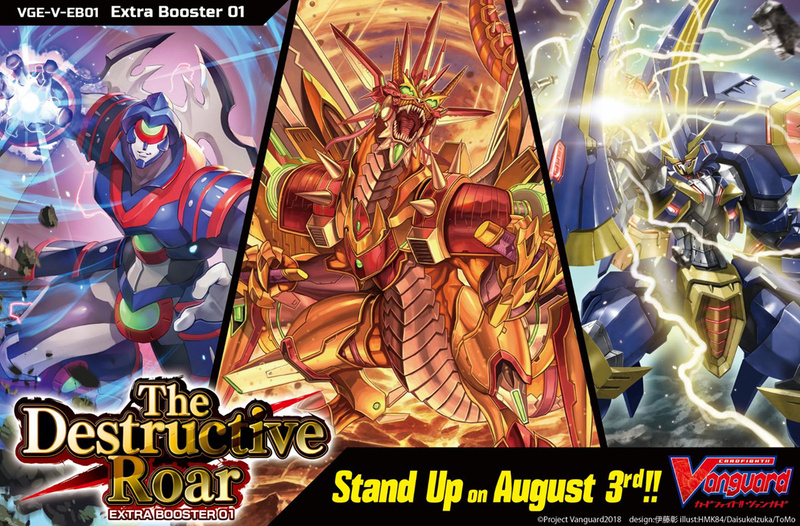 Previously Bushiroad had scheduled The Destructive Roar for a July release in the English format, but with the set now officially hitting in early August that leaves July without a new product release. Potentially, this could have a cascading effect that pushes Extra Booster 02 into September and Booster Pack 02 into October, but the company has yet to issue an official statement. Currently no hard release dates for any product beyond EB01 exist for any region. Of note is that since 2014 the Cardfight!! Vanguard World Championships have begun in August, so cardfighters looking to play any of the three clans out of EB01 or EB02 may be faced with very little time to prepare before regional qualifiers start up.